I love Appleby Horse Fair. In truth I’ve never been there, nor am I likely to go. But we know it’s happening, very soon, and here’s how we know. 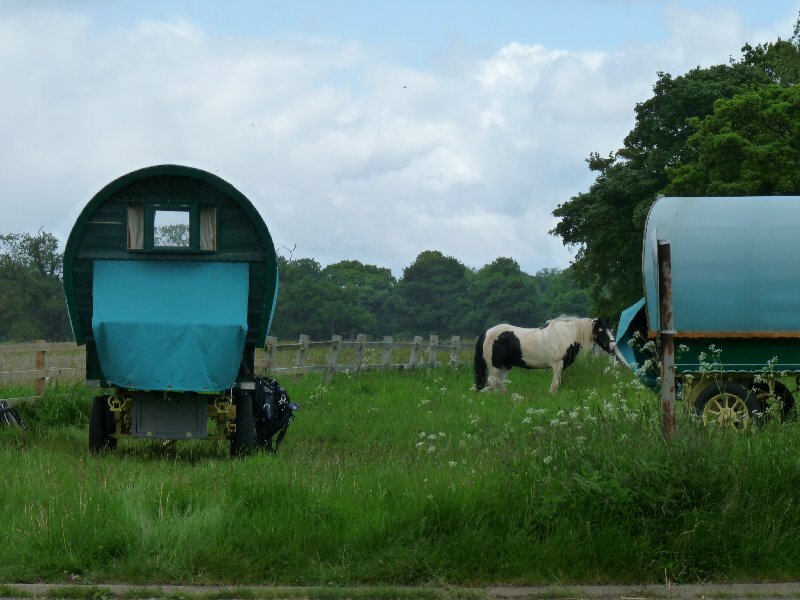 Every day for a week or more, we’ve seen sturdy shire horses, or work-horses in any case, plodding steadily up the main road out of Ripon, drawing behind them colourful and traditionally decorated gipsy caravans, or vardoes. That’s how we know that it’s the horse-fair at Appleby pretty soon. Here in Ripon, we’re a good 65 miles from Appleby, avoiding motorways. 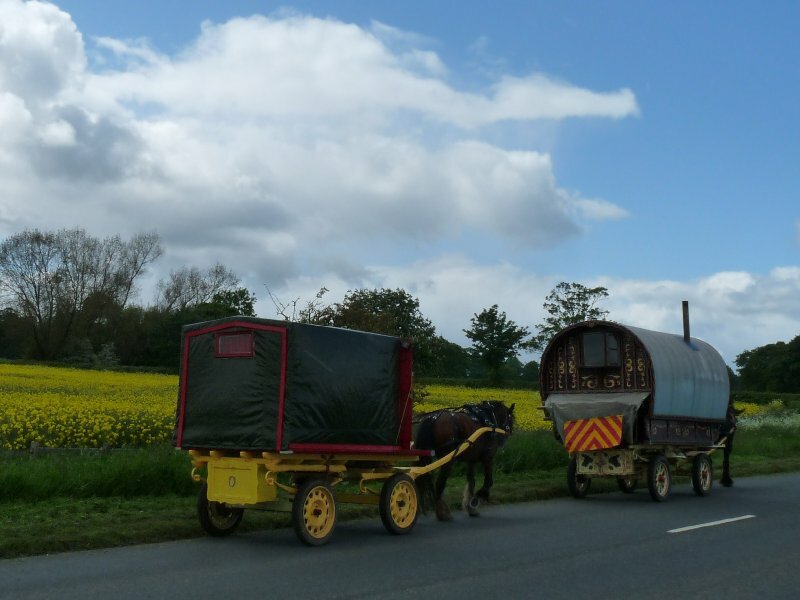 But some of those caravans are travelling from much far further away than that: travellers coming up from as far away as Wisbech in the Fens have made the news this week. This fair is a huge occasion. 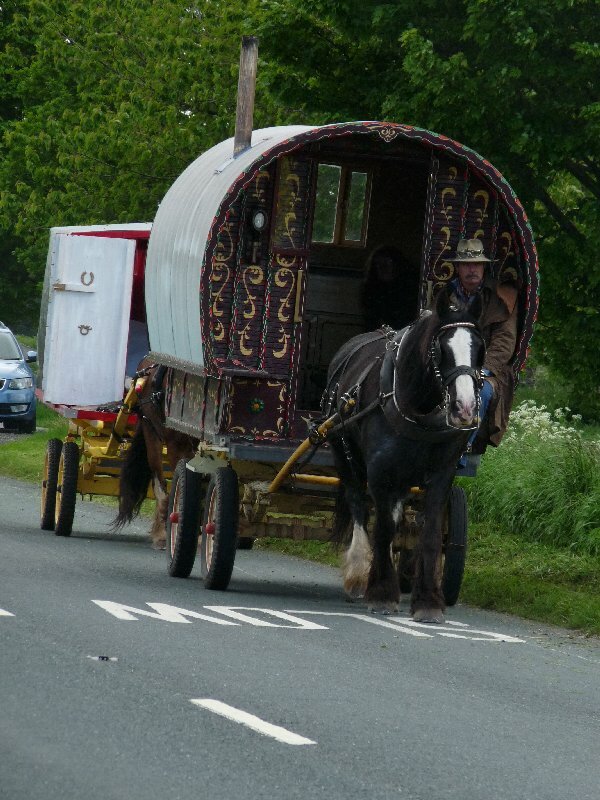 Every year in early June 10,000 – 15,000 English, Welsh, Scottish and Irish gypsies and travellers gather there to buy and sell horses, meet friends and celebrate their culture. Originally, when it started in 1775, the fair was held on unenclosed land just outside the town boundaries of Appleby. It was quite a different affair then, Sheep and cattle drovers and horse dealers met to sell their stock. Only gradually did it evolve into its present incarnation as a celebration of the Romany gypsy and traveller way of life. People tell stories that the fair evolved following the granting of a Royal Charter by King James II in 1685. Others say that the fair continues the tradition of Appleby’s mediaeval borough fair, once held at Whitsuntide. But no. The fair exists backed by no royal charter, no civic tradition. It was and is a people’s fair which nobody owns, and to which nobody charges admission. Overnight camp at the roadside. I wonder about these colourful travellers and their even more colourful vardoes. At night, they’ll tether their horses on the lush grass verges, and set up camp. Everything bar sleeping has to be done in the open air, since these vardoes seem to be no larger than the average single bed. By day, these horse-drawn caravans hold up traffic in long slow-moving tailbacks as they advance slowly towards their destination. Nobody seems to mind. But when do we ever see these sights except in the days leading up to and away from the fair? What happens to the caravans, and even to the horses in between times? Every gypsy and traveller encampment I’ve seen in recent years has featured large modern caravans and a motley crew of vehicles from state-of-the-art Mercedes to clapped out old Fords. It must make life more comfortable. I wonder if older traveller folk mourn the passing of the old days, or whether they’re quite simply grateful to have a home featuring all mod. cons? A short convoy of vardoes. I know I promised another post on the National Trust. That’s coming soon. Really. I used to go to the horse fair in Yarm when I lived in North Yorkshire. Most of the travellers there had those big, silvery caravans with etched glass, still rather beautiful but with all mod cons. No idea where they keep the traditional caravans out of season though. I haven’t seen one on the roads for years. I never saw them before we moved here. The caravans we see are homely, with bright paint, rather than with the whole etched-glass experience, but none the worse for that. I think you should go to the fair itself and report back–it sounds fascinating! There are a number of songs, mostly written by Ewen MacColl, I think, about the travellers and the prejudice they have faced. I like that the gather to preserve and honor their traditional ways, even while they accept modern improvements. It’s sort of like Highland Games or American county fairs, I guess. It does look interesting, and maybe one year we’ll go. This year is a bit full on for various reasons, so not just now…. What a wonderful tradition and thanks for sharing the story and photos of the travellers passing through. The travellers continue to make their way onwards. It’s quite a treat. When I saw the top photo it made me think of the film production of Sherlock Holmes Adventure of the Speckled Band where gypsies play the part of the red herring. How interesting I can’t imaging travelling great distances by horse drawn wagon. My how soft we’ve become! Have a wonderful week ahead – June is near. We are big softies, aren’t we? Especially in this cold year. June next week? I think not. Enjoy anyway! Wisbech? Really? All I ever see are convoys of big white shiny caravans heading for the Norfolk coast! Must look harder. Perhaps they were just that really. I have only ever seen a caravan like this perhaps twice in my life. The last time was fairly recently, they travelled slowly through the area, camping as they went. They are a wonderful sight, but my goodness what a hard life it must be. I have always been drawn to them like a moth to a flame – the heavy hooved horse, the bright painted wagons. I have imagined what it must be like to taste the freedom of such a life, but I am not sure I would feel the same if I had to withstand a cold night or several. Yes, wonderful…. in theory. But you’d soon get fed up with meals-on-a-bonfire, wouldn’t you?